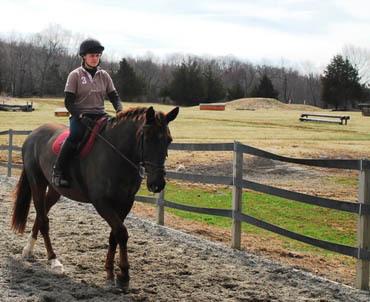 Cedar Crest Farm Equestrian Center is a state-of-the-art, purpose-built equestrian center situated on 64 secluded acres in the Millbrook hunt country of Dutchess County, New York. The facility complements our approach as it was designed by us from scratch to provide a complete, quality experience for riders as well as those who are boarding their horses. The 29-stall barn is built around a courtyard, combining the practicalities of an American barn system with the charm of a classic European stable yard. A 200’ x 80’ indoor arena is attached directly to the barn. Other features include a 160’ x 160’ outdoor arena, a state-of-the-art Belebro horse exerciser to maintain and improve horse fitness and an abundance of cross-country fences at novice and training levels. 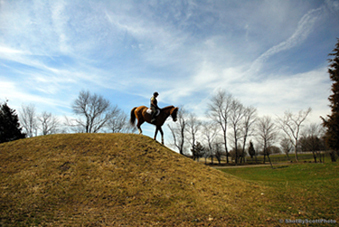 There are more than 40 acres of well-fenced turn-out paddocks surrounded by trails where riders can exercise or cool-off their horses. We strive to ensure that horses and riders have everything they need to accomplish their goals. Our Belebro horse exerciser maintains and improves horse fitness. Devoucoux saddles and Myler bits ensure maximum performance and comfort for our horses. To maintain all our horses in a tip-top condition we feed a specially formulated sweet feed, designed with veterinary consultation and freshly prepared by a local supplier. 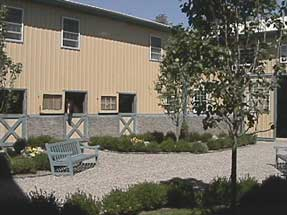 Having worked in a number of different equestrian facilities as well as advising on the building and design of many others we were fortunate, in 1999, to have the opportunity to design our own facility where we incorporated in one delightful location the best features and ideas we had encountered over the years. With the safety, comfort and well-being of horses and riders constantly to the fore we feel that we have successfully developed a smooth-running equestrian environment. Our focus on quality influences every aspect of our operation. Our horses eat a well-balanced customized feed sourced from an excellent local supplier and are only ridden in top-of-the-range Devoucoux saddles. Most wear Myler bits for maximum comfort. Our riders can relax in a comfortable club room with adjoining kitchen and avail themselves of an extensive range of equestrian DVDs and books. It is this attention to detail, together with a well-trained, positive staff, which allows our clients to make rapid improvement in a pleasant and harmonious atmosphere. Our facilities are certified by the BHS which means that they adhere to a strict standard of excellence. Fewer than 10 equestrian facilities in the United States share this distinction.